2 Bedroom Detached Bungalow For Sale in Dronfield for Guide Price £725,000. 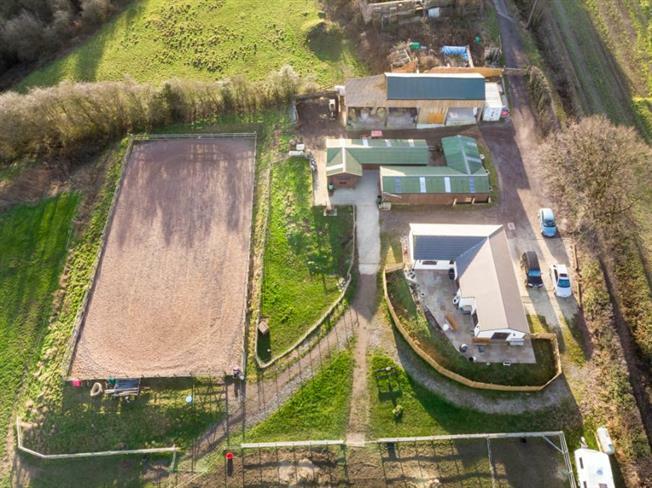 This is a fantastic opportunity to acquire an equestrian property with land, mnage, stables, tack rooms and barns. The oak front door opens into an attractive kitchen/diner which is beautifully furnished with a Belfast sink, boasting a range of quality fitted wall and base units , integrated appliances including a wine cooler. A particularly attractive feature of this room is the vaulted ceiling which gives it a light and airy feel. There is underfloor heating to the Kitchen and living room. The dining area has French doors leading out onto the sun terrace ideal for al fresco dining and which runs down the side of the property and overlooks the mnage. A corridor leads from the living area to the two good size double bedrooms. There is a Jack and Jill bathroom with access from the hallway and master bedroom. The bathroom is both spacious and attractive having a bath with claw feet , shower unit, toilet and wash hand basin. The professionally installed mnage measures 20m x 40m is floodlit, has rail fencing and a gated access. The fields are surrounded by hedges and fences and are visible from the property. This is a rare opportunity to acquire such a lovely property nestled into countryside and yet so close to facilities in Dronfield and surrounding areas. Please view the virtual tour for this property.